Oh, Jennifer. This is a beautiful tribute. Thank you. And, thank you to your husband. 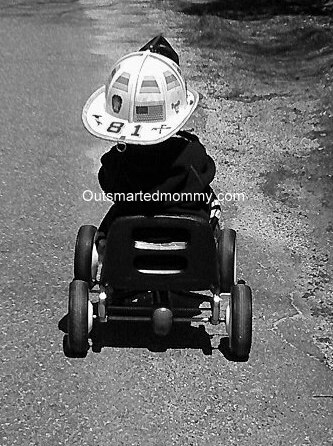 On a happy note, your son is absolutely adorable in the fireman hat! Do me a favor. Tell your husband I said "Thank you." And just like that you bacame the first commenter to ever make me tear up. I will be sure to tell him. Thank you. On behalf of my family, please pass along our love and thanks to him and his brothers. (And thank you David for sharing this. I will do just that! Thank you. You are so much braver than I could ever hope to be. Thank you, for selflessly sharing your husband. For giving up the comfort of knowing he's always safe, in order to make sure that the rest of us are. You know you're a hero, too, right? Jenn thank you for that...really, thank you. Beautiful post; you made me cry. 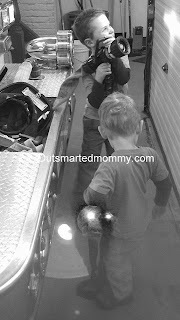 Thank you to you & your husband & your little future firefighters. Thank you for taking the time to read it and send your thanks. Jenn I can't tell you how this hit me. Knowing many FireFighters and knowing what their wives mother's children and families got through each time they kiss them good bye. You too as the other Jenn said a Hero. Thank you for this beautiful piece. It touched me in a special way. and thank you for adding Social workers to your list. Recently I was with a couple, he is a firefighter she is a RN. She was giving him crap about not working a lot. I was mortified. I turned to her and said I don't care if he only works 1 day a year, the man chooses to run into buildings to save people when other's are running out. Please thank your husband, and what a wonderful tribute to those fallen. So sad and horrible for the entire community and their families. I will thank him. Thank you for taking the time to read and comment. It is so terribly sad what happened to that community and their families. What a sweet post! I have always admired the women who are married to firefighters, police officers, soldiers. I honestly don't know if I could do it. In my eyes, the wives, mothers, and families of these people who serve others so selflessly are heroes too. So, thank you and thanks to your husband and to all the other families out there who do what you two do! Aw...thank you for that! It means a lot to know people appreciate us. wow. Tears. Yes, they are not forgotten. This is a beautiful and heartfelt tribute to them. Please do tell your husband thank you from all of us. I understand your pride and fear. My husband is retired Army and now works for the government. He recently went to Afghanistan and while I was proud, I was really worried, too (he came home and is fine). It's a delicate balance, the love and protectiveness we feel over our heros. Truly beautiful post. Thank you Kristi! I'm so happy to hear your husband is home safe. That was such a tragedy. I can't imagine what these families are going through. I love your post. it is lovely. WOW. This is a beautiful post. My heart breaks for the families who lost loved ones. This is so beautiful Jennifer! Thank you for your words, and mostly what is behind those words in your heart! Thank you Angela. Please tell your family we are thinking of them and will do everything we can to help. I know I am not alone in hoping that the city of Prescott and the State of Arizona will do what is right and give Juliann the benefits she so deserves. You write so beautifully that I feel what you're feeling as I read this. And I love that you write from the heart. This is such a touching post.